How Do You Find the Slope of a Line from Two Points? Calculating the slope of a line from two given points? Use the slope formula! This tutorial will show you how! What's a Numerator and What's A Denominator? Numerators and denominators are the key ingredients that make fractions, so if you want to work with fractions, you have to know what numerators and denominators are. Lucky for you, this tutorial will teach you some great tricks for remembering what numerators and denominators are all about. What's the Formula for Slope? 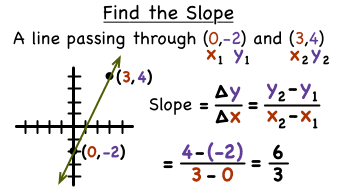 When you're dealing with linear equations, you may be asked to find the slope of a line. That's when knowing the slope formula really comes in handy! Learn the formula to find the slope of a line by watching this tutorial. What Does the Slope of a Line Mean? You can't learn about linear equations without learning about slope. The slope of a line is the steepness of the line. There are many ways to think about slope. Slope is the rise over the run, the change in 'y' over the change in 'x', or the gradient of a line. Check out this tutorial to learn about slope! What's Slope-Intercept Form of a Linear Equation? When you're learning about linear equations, you're bound to run into the point-slope form of a line. This form is quite useful in creating an equation of a line if you're given the slope and a point on the line. Watch this tutorial, and learn about the point-slope form of a line! How Do You Graph a Line If You're Given the Slope and a Single Point? Trying to graph a line from a given slope and a point? Think you need to find an equation first? Think again! In this tutorial, see how to use that given slope and point to graph the line. What's Point-Slope Form of a Linear Equation?